These are colors and combinations added within the last 3 months. 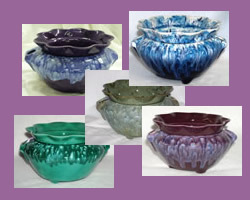 They will also be found in their color or style category. 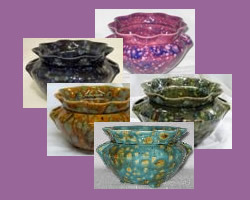 A base glaze color mixed with crystals of complementary color that burst and flow during the firing process to create unique patterns on the surfaces of the pots. A collection from all categories that we present as 'Earthtones', shades of green, blue, brown, orange and other colors of nature. 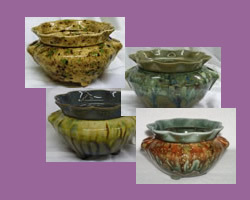 One-of-a-kind creations using combinations of glazes and techniques to simulate pottery. 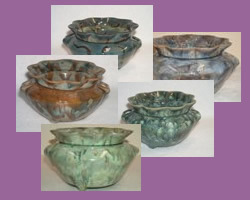 Patterns and shades will vary for each individual item but will be similar to the pictures shown. 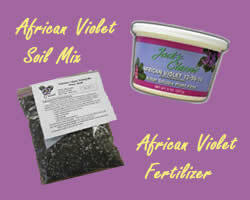 Other things you might need such as our special potting soil mix, and african violet fertilizer. 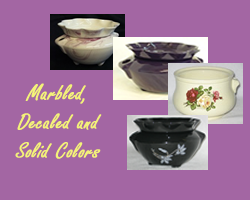 Unique and special designs, including fired decals and solid colors. 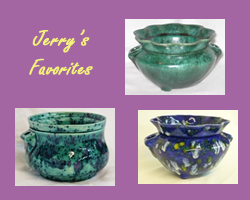 Check out the colors that are Jerry's favorites. If you can't make up your mind, maybe these suggestions will help! 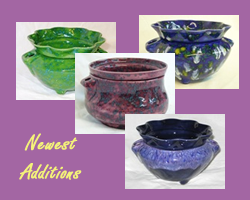 Limited quantities, discontinued or clearance items. Some may be miscellaneous items on hand. These will change frequently. From time to time, this category may be empty.